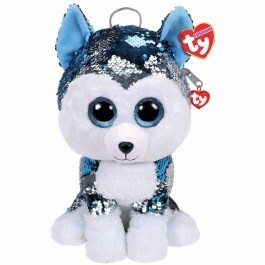 The Beanie Boo's Slush husky plush is now available in a sequin backpack! Complete with adjustable strap. In the shape of the adorable Slushy the husky, this plush backpack is covered in sequins that change colour with one flip of the hand and is finished by adjustable woven straps. A top zip fastening makes it easier for little ones to grab they’re essentials when their out and about.